Felice Cohen-Joppa and her husband, Jack, both became activists at a very young age—as pre-teens, actually. Felice took her first stand for justice when she wrote an anti-war article for her middle school newspaper; it was published despite her principal’s initial refusal to print it. Middle-schooler Jack got his start doing pledge walks to raise money to fight hunger and poverty. 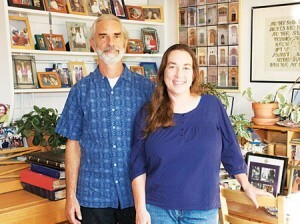 In college, Felice and Jack were in different states, but on the same anti-nuclear trajectory. They attended demonstrations, went to meetings and engaged in civil disobedience. Felice leafleted, organized teach-ins and attended conferences. Jack started writing letters to people in prison. Why do we put people in cages? Jack wondered. Is locking people up and brutalizing them—psychically, emotionally and physically—the best way to reduce crime? Jack realized that all of our country’s significant movements for social change have involved people being imprisoned, and he felt that supporting those people would be vital to any social movement’s success. In 1980, Jack and Felice collided and joined forces, starting The Newsletter of the National No-Nukes Prison Support Collective, now known as the Nuclear Resister (with the subtitle “A Chronicle of Hope” printed on every edition). 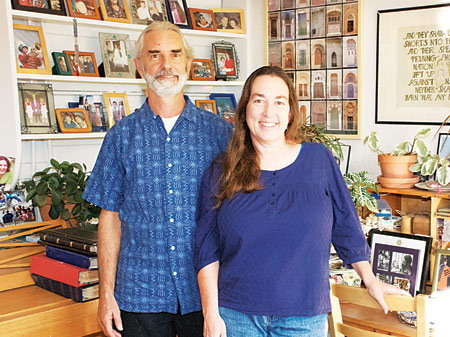 In 1986, the couple moved to Tucson—on the same day Chernobyl blew up in Russia. “That seemed auspicious,” Jack recalls. Maybe it was: For nearly 30 years now, the Nuclear Resister has dispensed information and support for imprisoned anti-nuclear and anti-war activists, and currently has about 1,000 subscribers worldwide. It has told the story of more than 100,000 anti-war and anti-nuke arrests in the United States, plus thousands more abroad. It’s provided support to imprisoned activists facing terms from two weeks to 18 years—from war-tax resisters to conscientious objectors to disarmament activists who’ve personally dismantled weapons of mass destruction with household hammers. Not only are Jack and Felice reporting on and supporting nonviolent civil disobedience against injustice—they’re still engaging in it. Last month, they joined more than 150 others rallying against torture in Sierra Vista, marching to the main gate of Fort Huachuca and the office of CACI, a private military contractor implicated in the abuse of Iraqi detainees. Jack and Felice attend monthly vigils at Davis-Monthan Air Force Base—not to protest the troops, but to show concern over unmanned aerial vehicles in the Middle East that they say are killing many more civilians than enemies. They also gather outside Raytheon Missile Systems—not to protest the hard-working citizens employed there, but to oppose war and the people who make a financial killing off of it. But Felice doesn’t shy away from supporting male activists, too—in fact, she’s perhaps most famous as the coordinator of the U.S. campaign to free Mordechai Vanunu, the nuclear technician turned whistleblower who gave the world the first concrete proof that Israel had nuclear weapons. Check out the Nuclear Resister online at nuclearresister.org.